PALM CITY, Fla. – Daniel Obremski of Pittsburgh, PA and Palm Beach Gardens, FL, continued his strong play Thursday at Martin Downs Country Club, scoring his third and fourth victories in the last five events conducted by the Minor League Golf Tour. Obremski posted a six under par 65 on the Osprey Creek course here and was awarded the victory after Will Evans of Charleston, WV, who also shot 65 earlier in the day, left and was not available for the playoff. Obremski also had the low 54-hole score for three tournaments this week, 21 under par 193. He was the winner Monday at Palm Aire CC in Pompano Beach and finished second Wednesday at Park Ridge GC in Lantana when Mike Miller of Brewster, NY, birdied the last seven holes for a 62-63 edge. 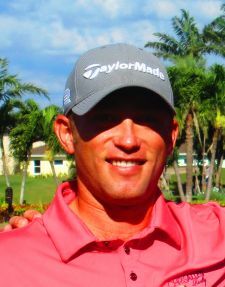 Obremski also won Feb. 22 at Jupiter CC. His earnings for the past eight days: $4,781.72. At Martin Downs, Obremski finished eagle-birdie to catch Evans. Obremski also had five birdies and a bogey. Evans made three birdies on each nine. 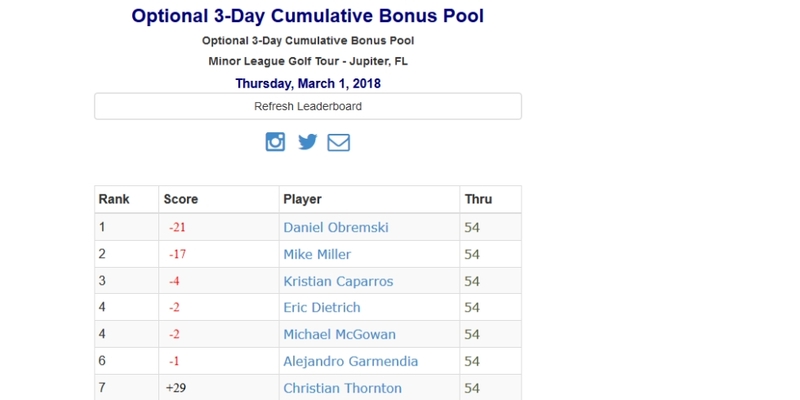 Obremski collected $1,000 from the $5,520 purse, $232 from an optional bonus pool and $125.72 in the skins game for a total of $1,357.72. Evans received $620 from the main purse. The MLGT’s 23rd tournament of the year drew 41 starters. Three more 18-hole events are scheduled next week: Monday, PGA National’s Estate course, Palm Beach Gardens; Tuesday, Abacoa GC, Jupiter; and Thursday, TPC Eagle Trace, Coral Springs.